Back in November 2012, Google updated its Maps service for browsers, as well as Android powered mobile phones and tablets, with indoor maps and floor plans of over 10,000 locations inlcuding airports, shopping malls, train stations, and museums. You can now add Free Library of Philadelphia to that growing list of institutions, joining our Parkway neighbors the Franklin Institute and the Philadelphia Museum of Art, that are now available on Google Indoor Maps. Google representatives visited the library back in August 2012 to survey the building and record GPS coordinates. Working together with Google's representatives, Web Development's Graphic Designer Kristin Crawford created detailed graphics of Parkway Central floor plans and uploaded them to the Google Maps Floor Plans interface. 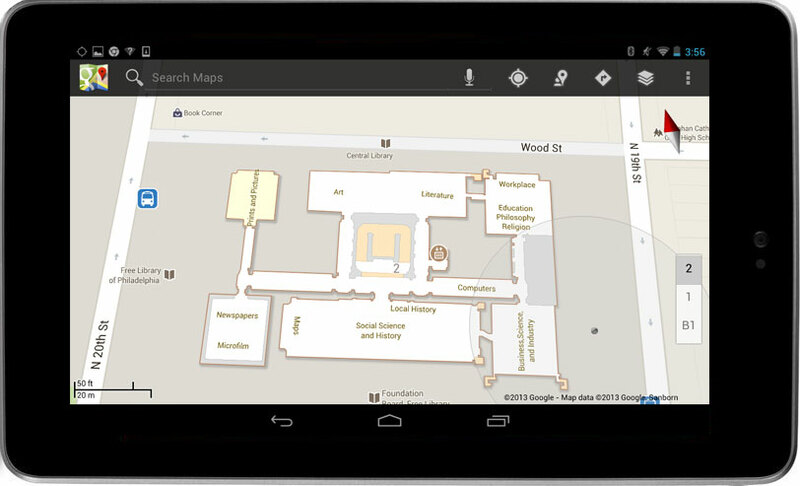 To explore the library with Google Indoor Maps via your Android mobile device, you just have to search for "Free Library of Philadelphia" and / or type in the street address, then zoom in on the map to access the detailed floor plans. 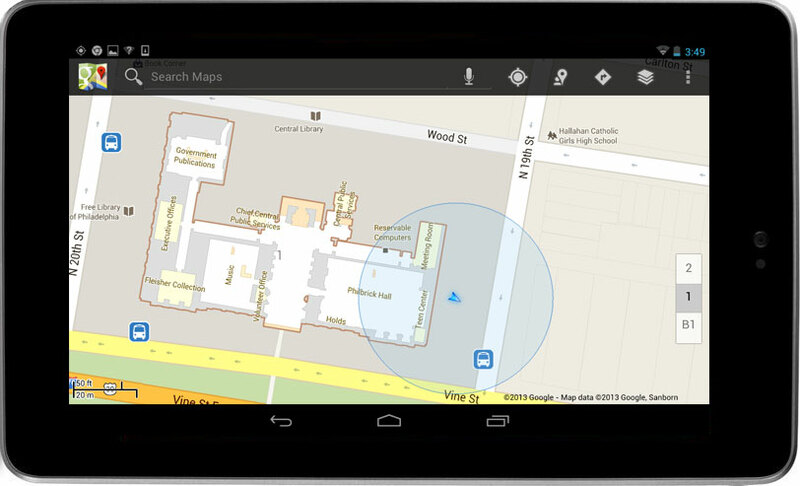 With you GPS activated, you can also access Indoor Maps via Google Maps’ My Location feature. Your location is represented by a blue icon, and when you move up or down a level in a building with multiple floors, the interface will automatically update to display which floor you’re on. 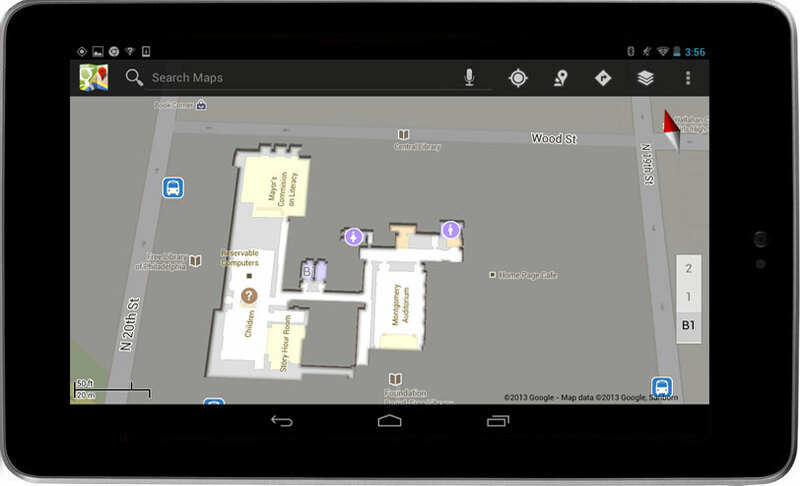 Google Indoor Maps is currently available via desktop browsers and Android mobile devices. An iPhone update to the Google Maps app that includes access to Indoor Maps is still forthcoming. 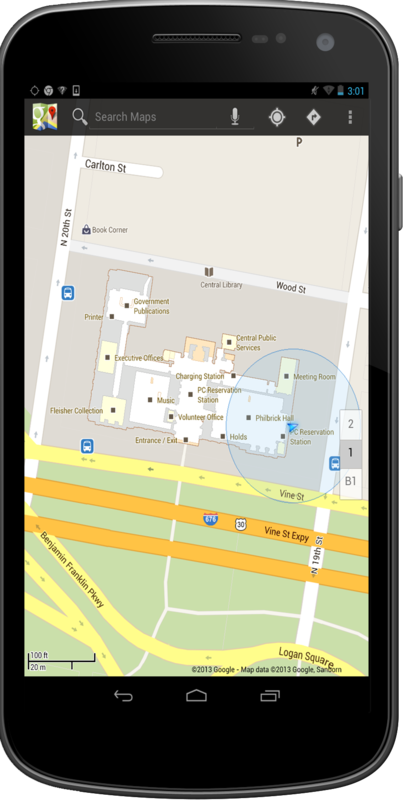 We hope to have indoor maps available for other branches of the Free Library system in the future!